Whichever installation design you choose, the method of water introduction to the chamber will have an effect on the efficiency of the brushes. 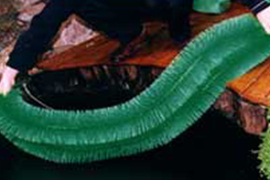 Generally the water should flow into the chamber at slow speed rather than being jetted in under pressure. Water travelling at high speed not only causes turbulence, which will disturb settled material, but it can also wash off some of the waste which has been trapped successfully in the brushes. 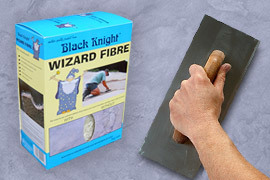 Before purchasing Black Knight brushes, you should decide what type of filter design will be best for your pond. If you have a small pond with a few goldfish and a couple of koi then a single chamber with three to six lines of brushes will be ideal. For a more demanding situation, it will be necessary to use a much larger chamber or to link two or three together. 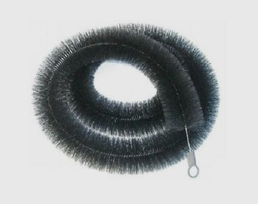 These can all contain brushes or you can use them in the first and second chambers and then use a stone medium such as Lytag, Canterbury Spar or Alfagrog in the last chamber. When a significant amount of waste has built up on the brushes, it should be flushed away. The brushes should be flushed using buckets of pond water. 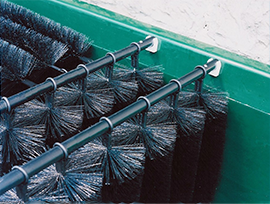 Cleaning in this way will retain most of the beneficial bacteria that live on the brushes but the rotting waste is removed and cannot do any more harm to the water quality.